If you only look at Chris Bosh’s line from Sunday night — scoring just 10 points on 3-of-12 shooting and posting a -7 — you would think that he had a bad game. But Bosh actually made a big impact both ends of the court. he played great help defense in the fourth quarter, and he was instrumental in pick-and-rolls. Bosh got the ball nine times in pick-and-rolls — well above his average of 2.4 times per game. Of those nine possessions, he rolled to the rim five times to score eight points. The Oklahoma City Thunder effectively stopped Bosh in pick-and-pops, which is how he predominantly functioned during the regular season. But they weren’t prepared for his PNR play, since he rolled to the rim just 39 percent this postseason. This is Miami’s second possession of the game. We pick it up halfway through as Dwyane Wade makes the catch up top and Bosh gets in position for a ballscreen. Bosh gets there and Wade dribbles off of it. 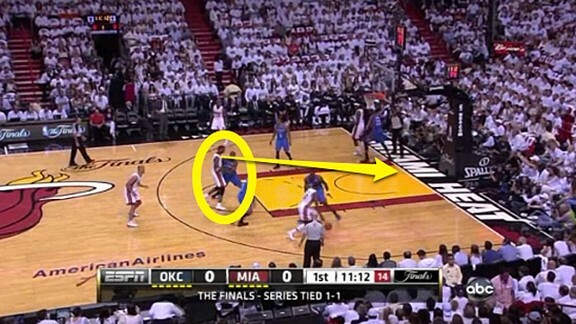 Kendrick Perkins, Bosh’s defender, shows on the screen to prevent Wade from penetrating and getting into the lane. Because the Thunder are expecting Bosh to pick-and-pop around the free throw line, Serge Ibaka goes over to help at the free throw line. 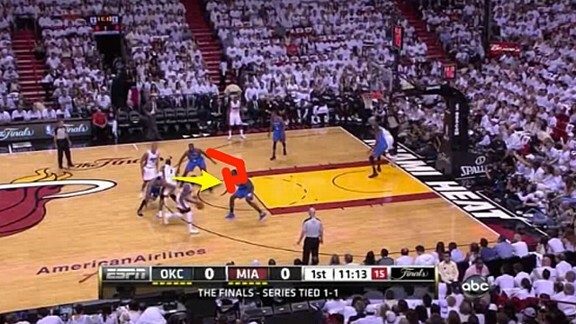 This was good defense by the Thunder, save for the fact that Bosh didn’t stop at the free throw line. After he was tagged by Ibaka, he continued all the way to the rim while Ibaka has to return to his man. Ibaka’s teammates weren’t prepared to help. 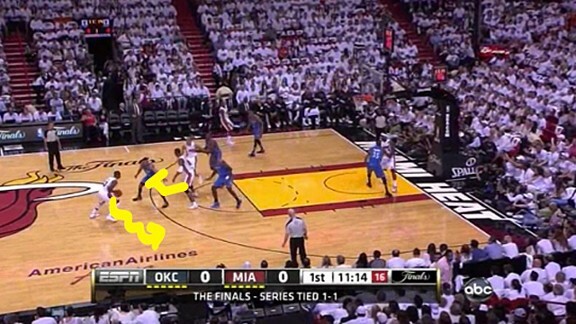 Thus, when Bosh catches the ball at the basket, he’s able dunk it before a Thunder defender can get there. Here is the play in real time. It’s as if there are two different plays going on in this possession. Initially the Thunder are in fantastic position, taking away Bosh’s pick-and-pop. However, once Bosh gets to the rim, the Thunder are utterly unprepared. This happened three more times during the course of the game, leading to points each time. In these three similar plays, the defense shifts toward Bosh, still expecting the simple pick-and-pop. He forced the Thunder’s back line to help, but they couldn’t stop him. The Heat don’t usually need Bosh to attack the basket — they have Wade and LeBron James for that. On Sunday night, we saw Wade and James come off of Bosh’s screens wide to give him the space he needed, knowing they’d beat the Thunder defense. 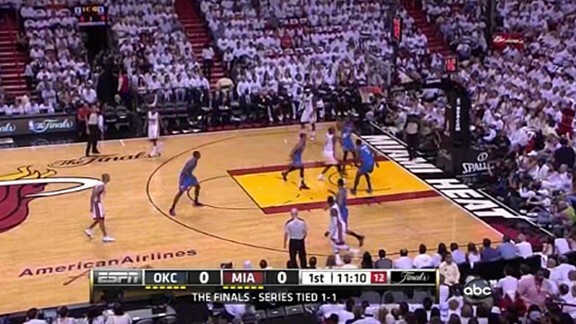 Down 2-1, Oklahoma City has to figure out how to defend Bosh in Game 4 to get a win. 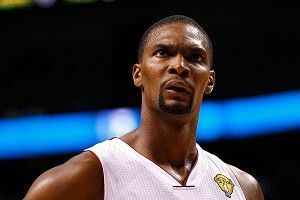 Bosh is now a threat.